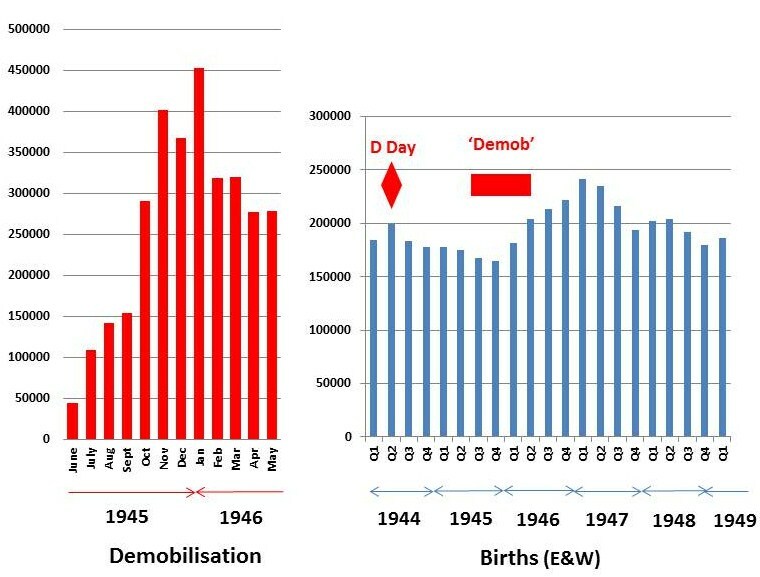 The two World Wars were both followed by short sharp surges in live births soon after demobilisation of the men who had been conscripted to fight. The children born after the First World War in the 1920 surge were, as it turned out, destined to fight in the Second. Then, after victory in 1945, those who survived were able to return home to start their own families. Thankfully, those who were born in that second 1946/1947 surge never had to be conscripted and were able to spread their family-building over a longer period, but nonetheless the concentration was enough to cause a further bump in the birth rate in the 1960s. 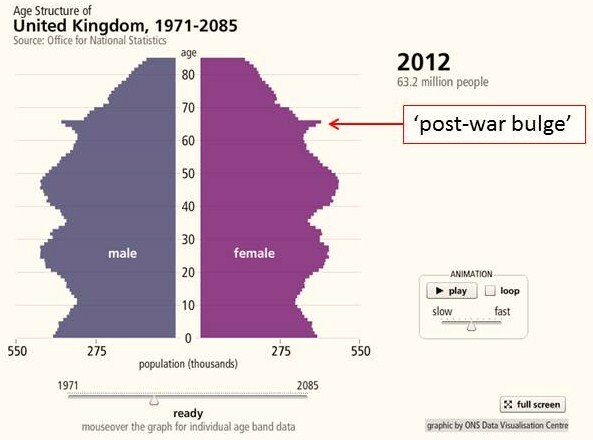 To underline this interpretation, the next pair of charts show the numbers of men and women being demobilised from the Armed Forces in 1945 and 1946, and births in England and Wales in the final years of that decade. That there was a lag of about three quarters (nine months) between demobilisation and maternal deliveries shouldn’t come as a surprise. 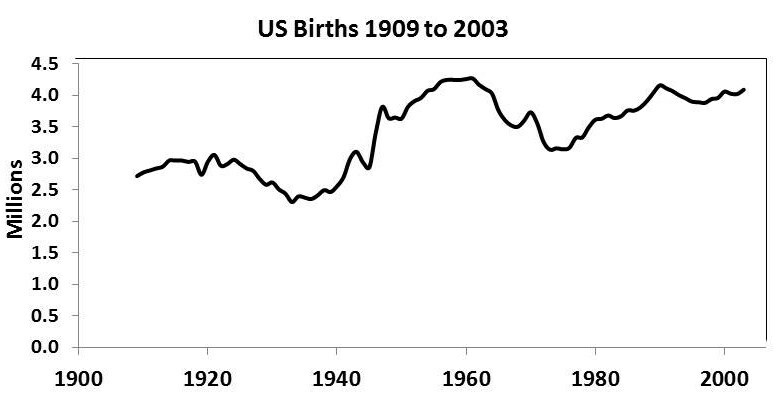 Nor should the drop in births in the last two quarters of 1945. This reflected the lower number of young males present in the UK after D Day in June 1944. 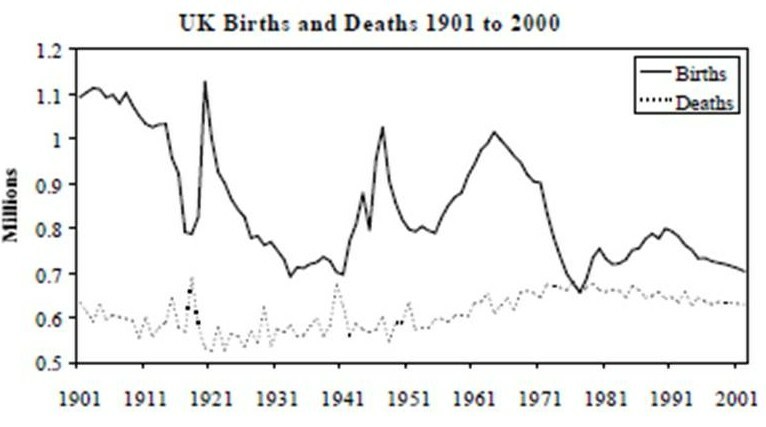 The UK experience was not the same as that of the United States which did have a sustained “baby boom”. 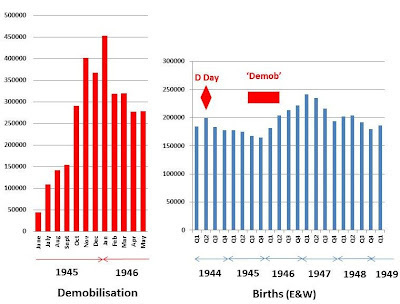 This also started with a higher birth rate after GI demobilisation, but then continued more or less unabated through to the 1960s, as can be seen in the chart below. Barry Pearson is another old codger with a similar bee in his bonnet: http://blog.barrypearson.co.uk/?p=3634 which provides a better graphical comparison of US and UK demographics than mine. … for most countries, the population pyramid — the demographer’s graph of choice, which classically shows each generation bigger than the one preceding — is often no longer a pyramid at all. Instead of being wide at the base and narrow at the top it is shaped more like a cowbell. If it were a real structure, the base would struggle to support the top. As a graph, it shows the young struggling to support the old. In the UK the change is particularly stark. As the baby boomers age, a vast bulge works its way up the pyramid into retirement, with all the fiscal menace of a python’s meal working its way along its belly. This is what people mean when they talk about the demographic timebomb, and why governments around the world are trying to raise pension ages. But as unpleasant as this outcome may be for taxpayers, if not the wealthy and retired baby boomers with free bus passes, this should not be seen as anything other than a transition period. I don’t think the ONS Age Structure chart supports talk of a vast bulge, let alone a python’s meal and belly (odd phraseology for a science correspondent, surely). 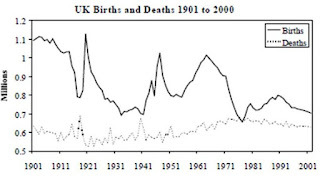 However, it’s more than likely that British journalists will still be writing about ‘baby boomers’ when the UK’s post-war bulge have long died out. Cheltenham colonels, bowler-hatted civil servants and blue-rinsed ladies all seemed to have endured in print for years after their departure from these isles. 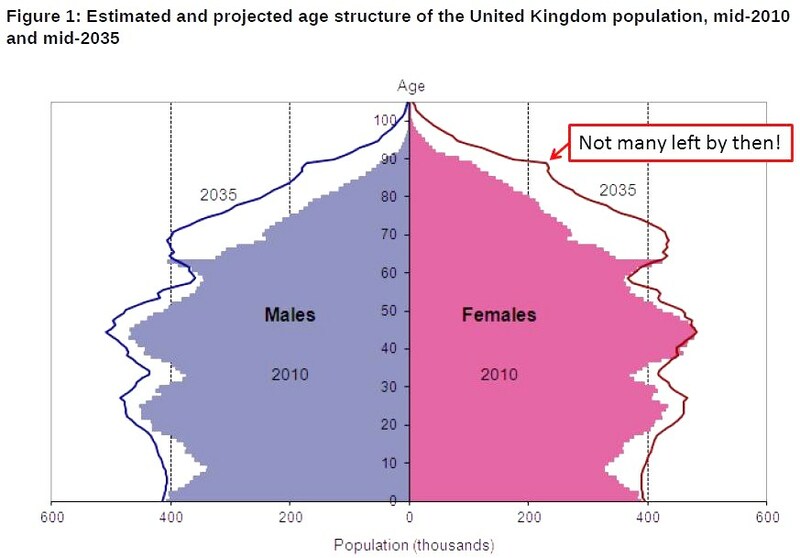 This turned out to be one of the more popular posts on this blog, so I thought it might be worth adding this chart taken from the ONS’s population projections for the UK published last month. I have been posting about this with similar conclusions. See my blog: I have several posts making similar points in different ways. Thank you for taking the trouble to comment and for placing a link to this post on your blog.